Lewis McDonald Grizzard, Jr. was an American writer and humorist, known for his Southern demeanor and commentary on the American South. 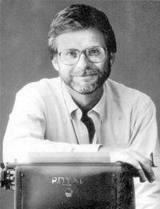 Although he spent his early career as a newspaper sports writer and editor, becoming the sports editor of the Atlanta Journal at age 23, he is much better known for his humorous newspaper columns in the Atlanta Journal-Constitution. He was also a popular stand-up comedian & lecturer. Grizzard also published a total of twenty-five books, including collections of his columns (e.g. Chili Dawgs Always Bark at Night), expanded versions of his stand-up comedy routines (I Haven't Understood Anything Since 1962), and the autobiographical If I Ever Get Back to Georgia, I'm Gonna Nail My Feet to the Ground. Although much of his comedy discussed the South and Grizzard�s personal and professional lives, it was also a commentary on issues prevalent throughout America, including relationships between men and women (e.g. If Love Were Oil, I'd Be About a Quart Low), politics, and health, especially heart health. Grizzard was also the stepbrother of the Southern humorist Ludlow Porch. Instead of getting married again, I'm going to find a woman I don't like, and give her a house. Being a newspaper columnist is like being married to a nymphomaniac. It's great for the first two weeks.